You define a satin column using a shape made of two mostly-parallel lines. Ink/Stitch will draw zig-zags back and forth between the two lines. You can vary the thickness of the column as you like. Combine two strokes with Path > Combine or hit Ctrl+K. Check path directions. For the satin column to work, they have to be equal. If they are not, with the Node Editor Tool (N) select one point of one sub-path and run Path > Reverse. This will reverse only the selected sub-path. Use node or rung method as described below. Then select your satin column and run params through Extensions > Ink/Stitch > Params or a custom shortcut key. Depending on the complexity of your design, this method might be time consuming, because the two paths must have the same number of points. This means that each path will be made up of an equal number of Bezier curves. Each pair of points acts as a “checkpoint”: Ink/Stitch will ensure that a “zag” ends up going from one point to the other. Add a contour to a path object (with no filling). 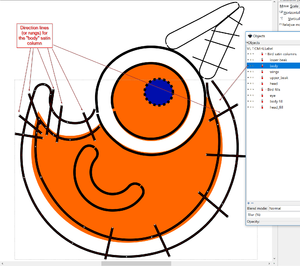 Set contour width to the size you want your satin stitch to be. The path should not intersect itself. Try breaking it up into multiple paths if needed. Make sure the existing satin column path (with the two subpaths) is selected with the Node Editor tool. Press P or select the Pencil Tool. Click once at the start of the rung. Click a second time at the end of the rung. Info: Rungs have to be shorter than the satin column itself. Otherwise Ink/Stitch will switch directions or you receive the following message: error: satin column: One or more of the rungs doesn't intersect both rails. Each rail should intersect both rungs once. Running Extensions > Ink/Stitch > Params will give you the possibility to fine-tune your satin column and to use underlay. For detailed information read through the Satin Params section. Read also this excellent article on satin column design. Make sure to have a look at the Satin Tools. They will make your life with Satin Columns a lot easier.